Now that’s scary! Putting my entire retirement at risk – Yikes!!! 1. 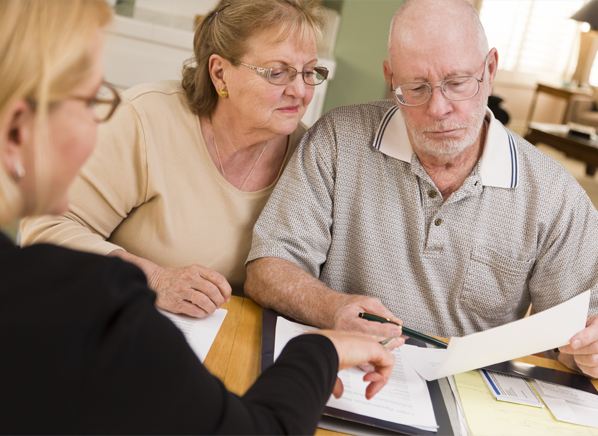 A Reverse Mortgage Does Not Guarantee Financial Security For The Rest Of Your Life. Correct. There is no single product that can guarantee financial security for the rest of your life. 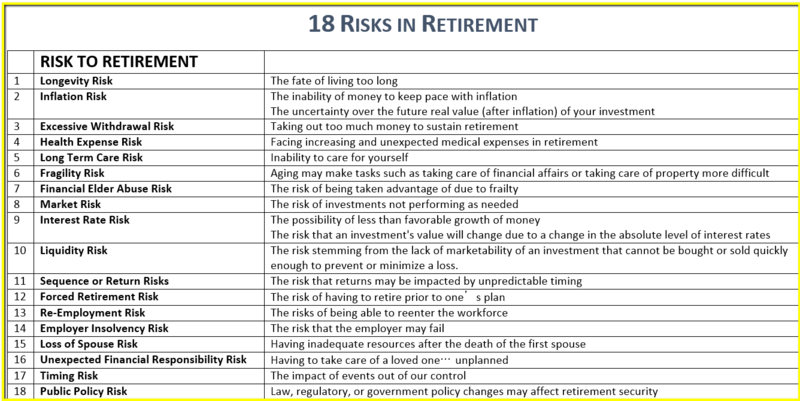 Given that there are 18 different risks associated with retirement (see below), it would take a combination of tools and a comprehensive plan as well and accompanying changes in client behaviors to pull off any retirement for today’s retiree. The good news is that Housing Wealth can and does play a significant role in achieving this outcome. An outcome that will not be obtained for most without using housing wealth. 2. You Don’t Receive The Full Value Of Loan. The face amount will be slashed by higher-than-average closing costs, origination fees, upfront mortgage insurance, appraisal fees and servicing fees over the life of the mortgage. In addition, the interest rate you pay is generally higher than for a traditional mortgage. Correct: There are very few, if any traditional refinance loans that give you 100% of the value of the home and have zero closing costs. Incorrect: The newly restructured HECM program has significantly lower closing costs (as little as $125) and interest rates that are very competitive with traditional loan products. 3. Interest Is Added To The Balance You Owe Each Month. That means the amount you owe grows as the interest on your loan adds up over time. And the interest is not tax-deductible until the loan is paid off. fuel, maintenance, and other expenses. If you don’t pay your property taxes, keep homeowner’s insurance or maintain your home in good condition, you can trigger a loan default and might lose your home to foreclosure. Correct: Isn’t this true for any loan? Not really very sinister then is it – lol. leaving fewer assets for you and your heirs. Borrowing too soon can leave you without resources later in life. 6. Generally, You Don’t Have To Pay Back The Money As Long As You Remain In Your Home. But When You Die, Sell Your Home Or Move Out, You, Your Spouse Or Your Estate, I.E., Your Children, Must Repay The Loan. Doing that might mean selling the home to have enough money to pay the accrued interest. Somewhat Correct but Incomplete: The HECM gets repaid when the last surviving borrower permanently departs the home. At that time the loan will get repaid. Whatever funds were advanced to the borrower plus accrued interest will get repaid. Typically the home is sold to pay this off and 100% of any remaining proceeds goes to the heirs or estate. Every HECM has this clarifying verbiage in the Truth in Lending. Let me spell it out verbatim. Did you see it? The Children are NOT responsible for repaying the HECM loan. Only the HOME itself is liable. This is understated by significant. Because many believe that children will someone have that responsibility. Not so. Like ANY mortgage balance that would be on a house when the owner died, it would need to be repaid, typically from the sale of the house. Nothing scary here folks, sorry. So the Consumer Reports article is a mixture of Truth, Partial Truth, Outdated Truth, but more of same type of reporting that sees the HECM in just area. – A product of Last Resort for poor seniors watching TV celebrities endorse the product. If the HECM puts your clients entire retirement at risk, it’s most likely that they did not have much of a retirement to begin with. Today’s HECM is a powerful and viable multi-faceted financial planning tool that has become and indefensible part of a comprehensive plan. Every advisor worth their salt, needs to know how they work. That is, if they want to stay competitive and relevant.